who made sizable contributions and others who have pledged similar amounts over a few years. Chapel Hill’s day to day operations, run cautiously and frugally, pay for themselves. A shortfall exists in funding for major improvement items such as the irrigation system, repairing or replacing ancient equipment and a myriad of other capital-type items that will facilitate operations into the future. We invite those with family or their own plots here to contribute a small amount for on-going improvements to help ensure Chapel Hill’s future. Your commitment of $100 per year will make a real difference. Please consider making this tax deductible contribution. 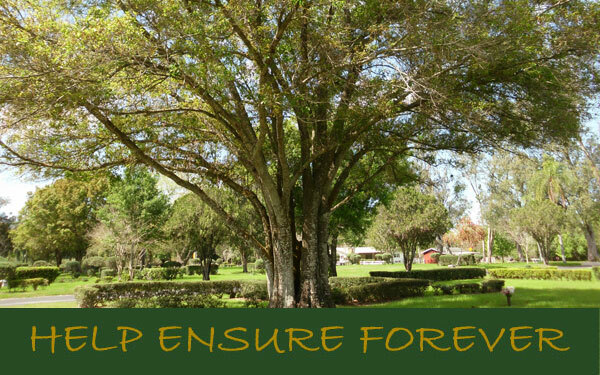 Should you have any questions or concerns about Chapel Hill, please feel free to call our General Manager or Administrator anytime at (727) 531-0475 or email at admin@chmpfl.com. Thank you so much for considering a contribution. It’s satisfying for us to know that you share our belief in the importance of our efforts. Please print the pledge card and send in to Chapel Hill Memorial Park.